"Splotched by Stan Lee on...."
Oh geez, please make it stop! He couldn't even hit the white. Yet another very high-grade mega-key destroyed. Put this in the horrid sig placement file. I honestly have a hard time thinking he doesn't do this on purpose. maybe it less of "on purpose" and more of a "doesn't give a damn"
I don't know...I mean he is in his 90's. It's not natural for anybody, let alone a 90+ year old to sit there and sign their name over and over for hours at a time. His handlers run a fast assembly line. His eyesight is not good. I think he tries, but just gets stuff shoved in his face, and it's 'chop chop, hurry up Stan'. No pictures, basically no talking, it's a very weird thing now-a-days. that's the part that puzzles me-- there have to be so many Stan Lee signed items out there already and he's charging pretty big money to keep signing. You don't seem to get to meet him-- just stand in his presence I guess-- and have him scribble on whatever. At some point-- these signatures would seem to be worthless other than some sentimental value. I can't understand the desire. Put aside rationality a moment. You have a comic in your hands and you want to make it into something "worth more." You could maybe try a press. Maybe get it put into a slab. Or what about adding a sig, that could do it! what about making a post in the Bronze Age Comics that are Heating Up thread? That's real good. Funny dude (seriously). I was focusing on the tangible book itself, very rudimentary and simple, but you're right, the more thoughtful and deeper way is to change perception in the market of the value of the paper in your hands - develop and nurture a false rumor about next feature film, paper some fake transactions on ebay, shill bid to inflate perception of price in other arenas, all the many tricks I've learned about since joining the boards. Course this last paragraph of stuff is not so much funny as sad. besides defacing the book-- I don't see any signature. How much does he charge for just a defacement? "Worth more" is starting to become debatable. 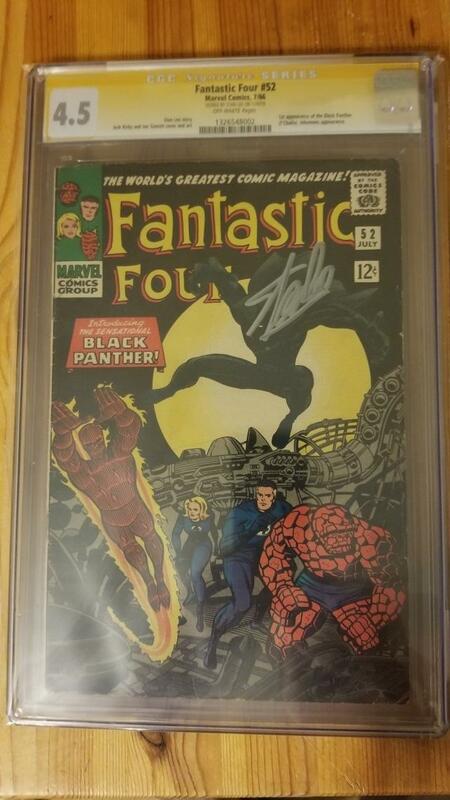 There are sooooo many Stan Lee signed books, that supply will probably outpace demand. Look at ebay. How many signed CGC books go unsold for whatever reason (price, placement, not desirable book) etc. I don't care one lick about signed comics. I do like to have prints signed, so I can frame them and enjoy them. But I have zero interest in a signed comic. For moderns I say ink them up all day long. I'd have a hard time watching one of those fat markers tagging up an old Altlas book though...would HAVE to be a ball point pen Stan! I'll pay you extra for that! In all seriousness, if an old book is rare and collectible, does even a nice looking signature add any value to it? Splash page perhaps? Placement...prep, prep, prep. This is one of my favorites in my own Silver Age SS collection. Although added props to Roy Thomas, overall he's really good with placement no matter what. Hey, I just found an example of a Stan sig that 100% DOES NOT affect the cover in a negative way. Heck yes, black sharpie on black ink, can’t fail! His signature basically blends in with Carnage. Brilliant!